Corneal tissue response to cross-linking treatment. Application to keratoconus treatment. The human cornea provides more than two thirds of the optical power depending on the curvature, the regularity, the transparency and the refractive index.The corneal shape also depends on the equilibrium between its structural stiffness (related to the topography, pachymetry or thickness and the corneal tissue properties) and the applied forces such as the intra ocular pressure (IOP) and the external actions over the anterior corneal surface. Many of the diagnosis techniques to evaluate corneal tissue instabilities (ectasia) before or after refractive surgery (LASIK, PRK, SMILE, etc.) are based on registering the topography, measuring the IOP and on the pachymetry. Recently (2005 and 2010), two non-contact tonometers appeared on the market in order to study the corneal stiffness or stability. Nevertheless, none of them is able to evaluate the contribution of the tissue microstructure to the cornea stiffness. The objective of this project is to evaluate the mechanical behaviour of the tissue, uncoupling the effects of the geometry and the IOP. 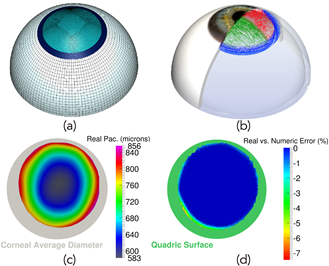 Therefore, it will be necessary to combine diagnosis techniques (non contact tonometry) on corneas of an animal model, with personalized finite element models of the eyeball. By using inverse analysis and optimization techniques, the mechanical properties that reproduce the experimental results will be determined. Determining in vivo mechanical properties of the corneal tissue will allow studying the efficiency of the crosslinking treatment. This is mainly used for stopping the apparition or progression of biomechanical instabilities of the corneal stroma (corneal ectasias, keratoconus, induced by surgery or infectious keratitis). Thus, an animal model (New Zealand white rabbit) will be used and morphological and mechanical changes will be evaluated depending on the used technique (UVA power, the exposure time, riboflavin type, etc. ).